I am in a difficult position at the moment because I have a whole set of different projects and commissions all at the sampling stage; this is not good news for anyone who is trying for a smoothly running working life. 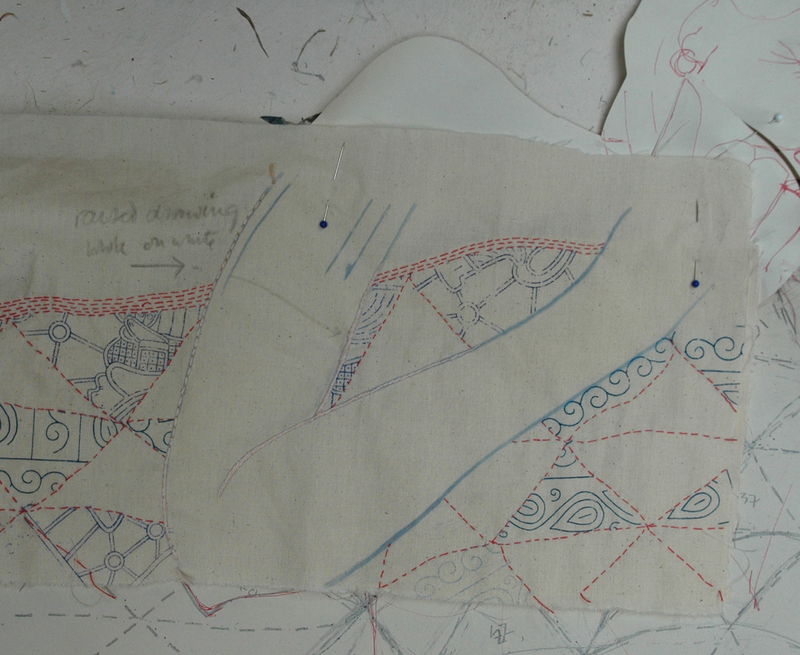 Usually I aim to have one or 2 ongoing sets of work at the ‘mind in neutral’ stage for when I embark on a new piece of work; by which I mean that the work is at the point where it is being manufactured, whether by stitching, enamelling or constructing…this is when you can think about the work as it is slowly progressing or mull over the next piece you will be making. Time to let ideas settle and allow solutions of sampling problems – see last 2 blogs – to rise to the surface. 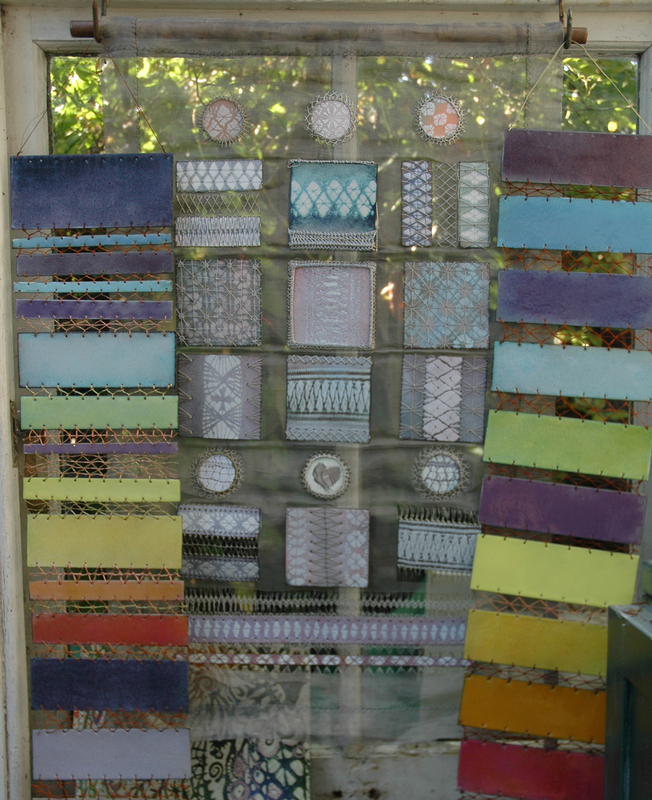 detail of studio wall with samples for stitching book and original enamel skies joining sample. But I have 4 main projects starting up at the same time, one is the enamel skies – my own work – so it is now having to take a back seat, but it was necessary to start it, as a website featuring the work is about to go live – it is for North Somerset Arts Week in May next year; 2 is a possible commission for a book on stitching; 3 is the Sheet of Dreams from Make it Through the Night project, again my own work and started in an attempt to get it going so I could just sit and stitch something between the drawing and development of the stitching book – keep up – 4 is another ongoing commission which will need to be kick started again when the artist comes back from her holiday next week after several weeks’ break. 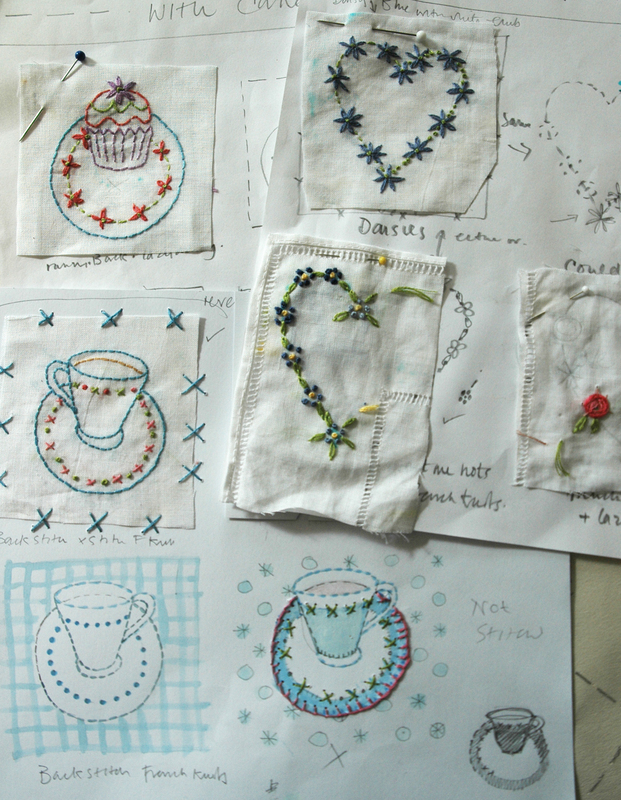 Oh and there are the stitched ceramics I am doing with Hanne Rysgaard, so that’s 5. And all are at the sampler stage and all need attention – the same sort of attention. 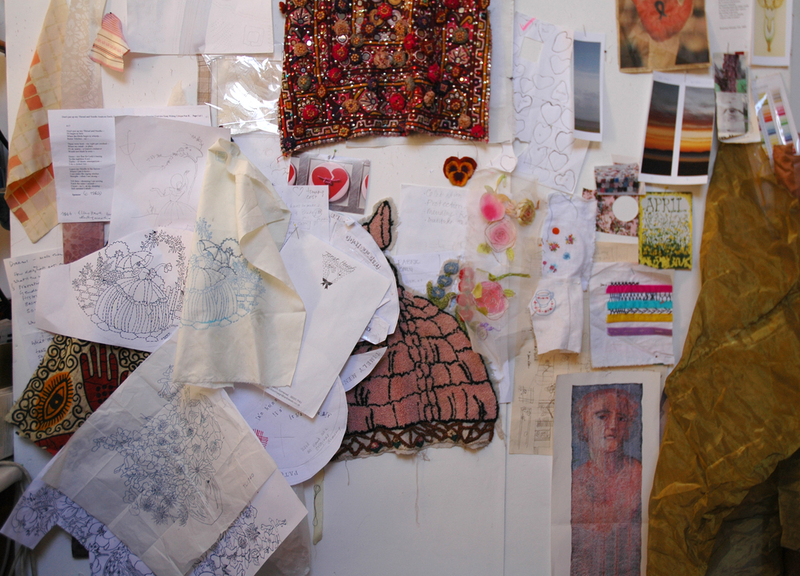 So my workrooms are full of bits and pieces of sampled new ideas, good ideas, failed ideas, hopeful ideas, anything to try to get me focussed on the jobs in hand. The most important project this week is the book presentation as it has to have 3 spreads, or double pages, with all the stitched designs, illustrations, technical diagrams and information organised in time to get it to the art editor who will sort out the overall look of the finished book for printingto show it to hopeful publishers at the Frankfurt book fair in October – as you can see I have been influenced by the work I did with Hanne on the tablecloth – or rather my commissioning editor was……. The idea of samplers being the traditional regimented rows of perfect stitching is of no practical use to me. The samplers we see in museums had more to do with illustrating young girls’ good behaviour and patience than their creative ability to problem solve – which is how I see the sampling process, an absolutely key component of any making project. I usually collect my samples together and pin or stick them into my work books when I have finished the project. They are often all the evidence that is left of my commissioned work, apart from the pictures of the finished image. But until that happens they are pinned to a wall as constant reference. 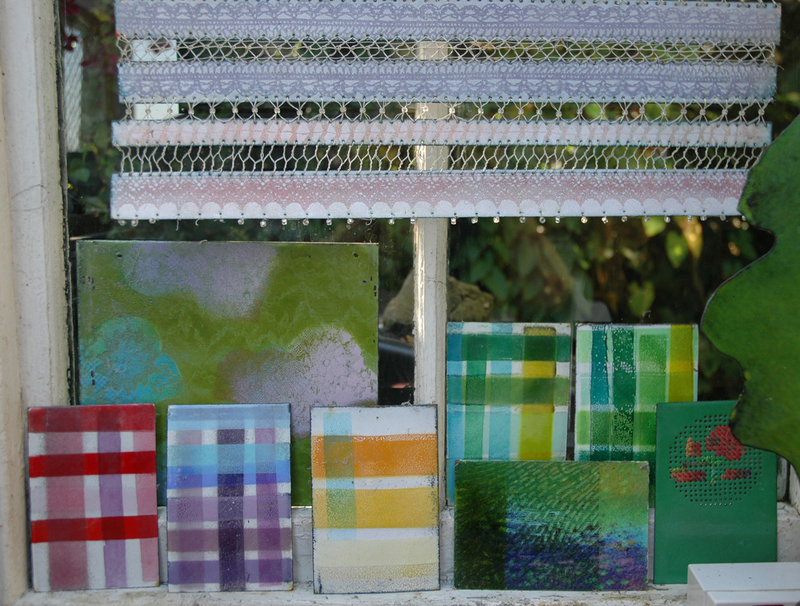 In my enamel workroom though things are even livelier, enamel is impervious to light and weather so I keep all my old samples on view, they are constantly referred to and I think it amusing that even my metal and glass samples look like mad gingham fabrics. 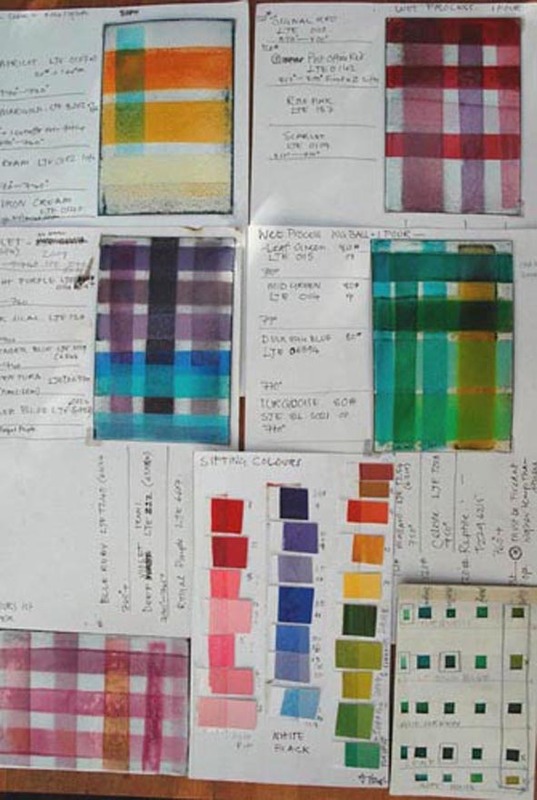 I use these colours so often that I do not need the notes that I made for the first colour samples, I know the properties of each colour well enough. 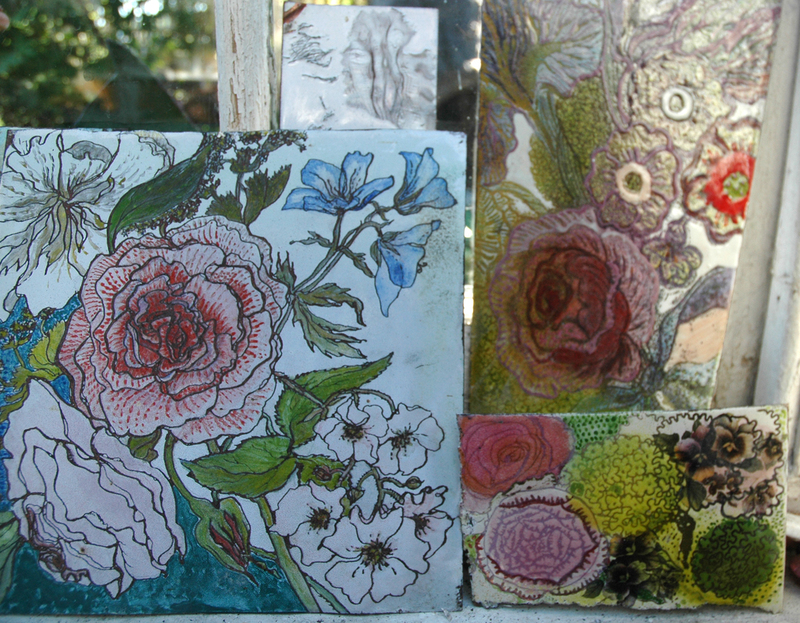 and on another windowsill are placed the drawn and painted samplers I made for the Chintz Collection in the Enamel Garden (see the Gallery Pages) sadly these are the only flowers displayed in my old conservatory. 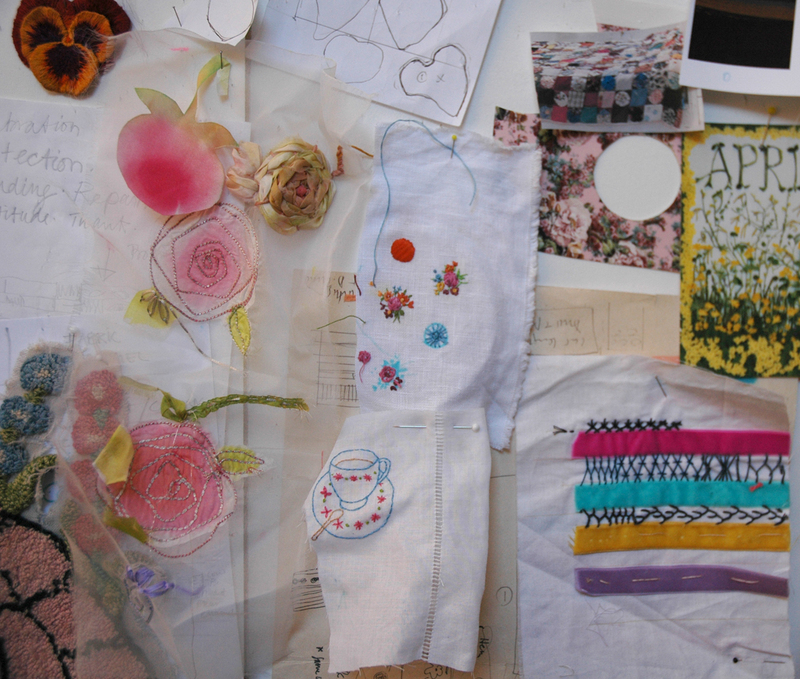 Categories: Drawing, Make - Do and Mend | Permalink.